Six proposed amendments to North Carolina's constitution will be on the ballot during the 2018 general election. Citizen Christians diligent about their civil duties are asking for information and direction on these amendments. The Christian Action League (CAL) is providing this explanation of the amendments from a strong Christian worldview with the hope of providing guidance in deciding their merit. The Christian Action League's position is also stated at the end of the explanation of each amendment. This amendment's purpose is to enshrine within the state's constitution the right to hunt, fish, and harvest wildlife. It would establish that hunting and fishing are the preferred means of managing wildlife. If North Carolina adopts this amendment, it would become the 23rd state to do so. Opponents of this amendment contend that it seeks to address a "phantom problem." They argue that there has been no assault on the right to hunt and fish in the state. Therefore, the amendment is unnecessary. Opponents also claim the amendment could create legal challenges to existing limits on hunting and fishing times, such as current prohibitions on Sunday hunting. It could be argued any limits on the right to hunt and fish may only come from laws meant to promote wildlife conservation or to protect the future of hunting and fishing. Proponents of this amendment argue intense urbanization has created tensions that place the traditions of hunting and fishing at risk of future legislative actions that would prohibit or limit the ability of North Carolinians to continue them. Also sited are concerns about the growing influence of animal rights activism and what affect it might have in denying the right to hunt and fish in prospective legislative initiatives. The Christian Action League believes the right to hunt and fish is supported in numerous passages of Scripture (Gen. 1:25-26; Gen. 9:3; Ex. 16:13; Acts 10:13). The CAL also believes that this God-given right is genuinely threatened by Leftist political ideologies that could become manifest and pervasive in future legislative bodies. It is true that the CAL has always been a strong advocate for limits on Sunday hunting (1) to promote the sanctity of the Lord's Day (Ex. 20:8-11, Mt. 28:1-10, Acts 20:7, I Cor. 16:2), and (2) to protect the safety of congregants and sacredness of worship services in rural churches. But after considerable deliberation, the CAL believes current Sunday hunting prohibitions are not threatened by this amendment, and even if they were threatened the danger would be remote at best. Furthermore, protecting the right to hunt and fish is paramount to any lesser concern of an unlikely legal challenge to limits on Sunday hunting. Therefore, the Christian Action League supports this amendment. North Carolina's constitution already guarantees rights for victims of certain crimes. The office of the North Carolina Secretary of State list the following: (1) the right to be informed of and present at proceedings related to the accused, (2) the right to be heard at the sentencing of the accused, (3) the right to receive restitution, (4) the right to information regarding the crime, how the criminal justice system works, and the rights and services available to victims, (5) the right to be informed about the final result of the case, (6) the right to be informed of an escape, release, or pardon, (7) the right to express views to the Governor or appropriate agency considering release, (8), the right to confer with the prosecutor. If this amendment is approved by the citizens of North Carolina, according to the North Carolina Secretary of State, it would expand upon the rights of crime victims and guarantee in the following ways: (1) to be treated with dignity and respect, (2) reasonable, accurate, and timely notice of proceeding, upon request, (3) to be present at any proceeding, upon request, (4) to be reasonably heard at additional kinds of court hearings, (5) restitution in a reasonably timely manner, when ordered by the court, (6) information about the crime, upon request, and (7) to reasonably confer with the prosecutor. Opponents argue these changes to the state's judicial system are unnecessary, when there are already strong protections in place, and it would cost an additional $11 million or more each year. Proponents of this amendment argue that it provides for victims of crime equal rights to those of the accused or those convicted of crimes. The amendment was inspired and based on what is known as Marsy's Law. Six states, including North Carolina, are considering Marsy's Law constitutional amendments in November. The approval of this amendment can also create a momentum for a constitutional amendment to protect victim's rights to be enshrined in the U.S. Constitution. *Marsy's Law was named for Marsy Nicholas, a young woman who was stalked and killed by her ex-boyfriend in 1983. One week after her murder, Marsy's parents walked into a grocery store and were confronted by her accused killer. The family had not been informed that he had been released from jail. Today criminals are too-often viewed as victims and law-abiding citizens are seen as aggressors. Exodus chapters 21 and 22 teach the obligation of civil government to defend the interests and rights of victims of crime. A biblical understanding of justice is not so much that the criminal has "a debt to society" to pay, but first and foremost, the criminal owes a debt to his victim. It could be correctly argued that currently a defendant possesses a greater status in North Carolina's Constitution than crime victims. This amendment works to change this by strengthening victim's rights and enshrining them into our state's most sacred document. North Carolina currently has a nine-member Bipartisan Board of Ethics and Elections that is responsible for enforcing ethics and election laws. Currently, the Governor appoints eight of the nine members of this board from nominees provided by the two largest political parties (4 Democrats and 4 Republicans). The Governor also appoints the ninth member, who is unaffiliated, from nominees provided by the other eight members. This amendment would reduce the board to only eight members, four from the two largest political parties (4 Republicans and 4 Democrats), and eliminating a ninth member. Republican and Democratic leaders in the legislature would nominate potential members of the board. The Governor would then choose eight members from the nominees provided by these Majority and Minority party legislative leaders and create a board of 4 Democrats and 4 Republicans. Opponents of the amendment argue that a board made up of only eight members, 4 Democrats and 4 Republicans, is all but certain to result in partisan gridlock, negatively impacting such important matters as access to the polls. Gridlock on this board could also adversely affect other matters over which it has authority, such as elections, lobbying reporting and registration, and ethics enforcement. Proponents of the amendment argue it is the best means for making the board bipartisan. Appointment of a ninth member on the board essentially permits the Governor to tip the scales of power, providing the Governor and his party with undue influence over critical decisions concerning elections and ethics. A ninth member also creates a scenario which potentially puts that member in control of much, if not all, of the Board's decisions. The amendment still allows a sitting Governor, whether Republican or Democrat, to choose its eight members, but the amendment would work to restrict partisanship, helping ensure the board's independence and objectivity. Even though disputes may sometimes result in a tie vote, gridlock works against both parties, and, therefore, forces them into making bipartisan decisions. North Carolina's Legislative Ethics Committee provides a model and is equally divided by political party. The Christian Action League agrees a Board tasked with the responsibility to oversee the way elections are administered throughout the state's counties, one that must act judiciously when irregularities become apparent, should as much as possible, be free from the policy preferences of the Governor or any one political party. Furthermore, the administration of ethics must be stringently fair, independent, and objective. This amendment works to balance power and produce an impartial process. North Carolina currently elects its judges, but when a judge is not able to complete his or her term, the Governor has sole authority to fill that vacancy on the court until the next election. The proposed amendment would end this system of political patronage, which is one of exclusive and preferential treatment, to an inclusive system of filling judicial vacancies based on a nominee's merit. The people of the state may nominate candidates for consideration. A Nonpartisan Judicial Merit Commission is established, appointed by the Chief Justice of the State Supreme Court, the Governor and the General Assembly, for the purpose of evaluating each nominees' qualifications, rating them based on their merits, and submitting a review of them to the General Assembly. The General Assembly would consider the nominees submitted by the Commission according its findings and choose at least two nominees to be sent to the Governor for consideration. The Governor would then appoint to the vacancy on the court from the two nominees the one he or she believes would serve best. The appointed judge would have to run for election to the seat at the next election in order to continue holding it. Opponents of this amendment argue that it presents a breach in the separation of powers between the Executive and Legislative branches, stripping the Governor of appointment powers and granting them to the General Assembly. They say it is a "power grab" – overreach by the Legislature that bestows more influence to special interests and politicians. They contend it would unleash the possibility for manipulations and cronyism on the courts, and even partisan court packing. Proponents of this amendment contend it would provide a needed change for filling judicial vacancies from one of political patronage, where individuals are given appointments as a reward for their electoral support, to one based in greater transparency and the merits of the judicial nominee. Proponents note that previous Governors have filled judicial vacancies with their political supporters during their very last days in office. When appointments to fill judicial vacancies occur between elections and have been known to account for approximately 40% of the judges seated, a more inclusive and merit-based process is desperately needed. The Christian Action League believes that any process for the selection of Judges should be the one closest to the people. Power vested in one individual with no checks is a recipe for power's abuse. Power works best when it is shared. The Scriptures command, "Ye shall do no unrighteousness in judgment: thou shalt not respect the person of the poor, nor honor the person of the mighty: but in righteousness shalt thou judge thy neighbor "(Lev. 19:15). This command is one of the most important in the Bible dealing with civil government. If those appointed to judge are not to show partiality in the way they render their judgments, neither should the means for appointing judges show partiality in the way they are appointed. The current system, which confers all authority in the Governor, provides for a "jaundiced eye" and should be changed. The proposed constitutional amendment would work to protect the judiciary's requirement to be impartial. The selection of judges to fill vacancies would be based on the qualifications and excellence of the nominee. Moreover, the process engages the public in the selection of judges, and has checks and balances that include in some manner all three branches of government, the Judiciary, the Legislative, and the Executive. North Carolina's tax rate, both personal and corporate, is capped at 10%. The proposed amendment would reduce the income tax cap from 10% to 7%. The amendment would not reduce current taxes. The current individual income tax rate is 5.499%, while the corporate income tax rate is 3%. The amendment only limits how much the state income tax rate may increase. North Carolina's individual income tax rate has gone up as high as 8.25%. Opponents of this amendment contend that it would tactically deprive the state of billions of dollars that might be needed for public services such as education, health, transportation, infrastructure, etc. When there is something like a recession, state revenues are typically less. When this happens lawmakers should have the option to increase state tax rates to generate needed additional revenues. If raising taxes is not an option, this can create pressures to cut spending on core public services. Without the option of raising taxes in times of emergency, new taxes and fees would likely be imposed on budgets of city and county governments to supply satisfactory revenues. It could also precipitate borrowing by state and local governments and thereby put the State's triple A bond rating at risk. Proponents argue this amendment will help protect citizens from a repeat of the tax and spend days which were characteristic of previous legislatures. The higher tax rates of those days produced a sluggish economy in the state and hampered growth. Previous state budgets were marked by huge deficits. Smart fiscal policies in recent years that have restrained state spending and provided significant savings have now placed the state in the position to take advantage of this opportunity. In 2019 the income tax rate will dip to 5.25% and the corporate tax rate to 2.5%. Raising personal and corporate income taxes is a less predictable and reliable means for generating revenues during a recession. Should the state be struck by a recession or emergency, the $2 billion currently set aside in the "Rainy Day Fund" ought to significantly reduce the need for additional funding sources. Protecting the state's Triple A Bond rating is best preserved by fiscally responsible budgeting, and not raising income taxes. Taxes are inevitable. Jesus commanded to "Render unto Caesar, what is Caesar's" (Mt. 22:17-21). The apostle Paul instructs, "Pay to all what is owed...taxes to whom taxes are owed, revenue to whom revenue is owed..." (Rom. 13:7-8). Nevertheless, the Bible is also hostile to high taxes – to over taxation. High taxes are indicative of a culture's rebellion against God (example: I Sam. 8:10-18). The Bible offers no direction on taxation rates, except that it should be lower than 10%. If it is as high as 10%, then it is equal to the tithe which God commands of his people. If God commands no more than 10% of his people, then what right does the state have to require more than God himself? The state thus claims equivalence with God. North Carolina should bring its tax rate to below 10%, which is what this amendment does. Much could also be said about the numerous areas where government has wrongly interjected itself. The Word of God only authorizes the state "to bear the sword and protect the innocent from evildoers" (Rom. 13:1-7) – to tax to protect and preserve the God-given right of citizens to their life, liberty, and property. But Progressives are too willing to use government coercion to plunder the pockets of the citizenry or the state treasury to provide public services where private enterprise, charity, and the church could do a better job. Even when such policies are well-intended, they are not according to knowledge (Hosea 4:6) and overtime do more harm than good to the economy and the population for whom those services were meant. Although this amendment was not necessarily crafted with these principals in mind, providence has provided this golden opportunity to bring our state government closer to the model on taxation seen in the Bible. It will not only work to protect and preserve the state's prospects for prosperity, but it would make the state better situated for the blessings that God longs to give. This amendment would require persons who wish to vote to present photographic identification (a photo ID) before casting a ballot. If this amendment passes, the North Carolina General Assembly would have to craft and adopt legislation providing the specifics of the requirement. In 2013, the state legislature passed detailed Voter ID legislation, which then Gov. Pat McCrory signed. The Voter ID requirements were used in the March and June primaries of 2016. However, Voter ID was highly contested at the time with protests and litigation by people largely from the political Left. Federal courts would later knock down the requirement along with a block of other election changes the General Assembly had made, ruling that the new rules targeted African-American voters with discriminatory intent. Opponents of this amendment argue that the evidence for voter fraud is insufficient to warrant the need for Voter ID. The purpose for requiring Voter ID is to suppress the voting power of minority races, the aged, as well as the poor who would have difficulty meeting the mandate for photographic identification. Moreover, the amendment does not state clearly what form of photo ID would be required. Proponents of this amendment contend that mandating the showing of a photo ID before voting is the surest way to reduce the probability of voter fraud for people on both sides of the political aisle. 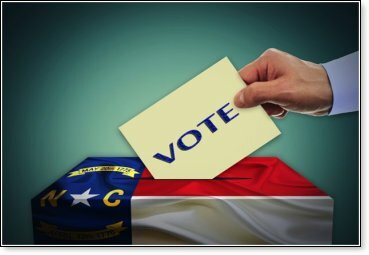 Voter fraud is real and has been documented nationally and in North Carolina. Polls consistently show that the vast majority of North Carolinians support requiring a photo ID before voting. Thirty-four states require some form of Voter ID. All of the southern states currently have a Voter ID law except the Tar Heel state. The U.S. Supreme Court ruled in 2008 that requiring a photo ID before voting was merely a slight burden on the electorate, which in no way outweighs legitimate state interests. There is no right in a Representative Republic, like our own, more sacred than a citizen's right to vote. Throughout its teachings, the Scriptures require integrity in all things, saying, that we should be committed to "taking pains to do what is right, not only in the eyes of the Lord but also in the eyes of man" (2 Cor. 8:21). Voter fraud is real and hundreds of people have been convicted of this crime in the U.S. and cases of voter fraud have been cited and documented in North Carolina. But even if there wasn't widespread proof of voter fraud, isn't the very possibility of trickery – the alleging of voter deception – a matter to be vigorous in trying to prevent? For instance, if it were difficult to prove a claim that there was illegal street racing on a certain highway, wouldn't that be reason enough to send the Highway Patrol to watch the area as a preventive measure – the saving of lives should be paramount. The same reasonable principle should also apply to minimizing the potential for voter fraud. Protecting and preserving the integrity of the vote should be paramount. Putting this amendment in the state's constitution will allow North Carolina citizens to decide the issue and insulate it from any reversal by state courts. Lawmakers can hash out the specifics after its approval in the legislature, making certain it sufficiently safeguards the rights of minority and less fortunate people who say it would be a hardship to secure a photo ID, as well as carefully shaping any Photo ID voting law to meet constitutional muster on the federal level. The state currently has greater requirements of all its citizens for lesser duties. It is only a slight burden to require a photo ID of all the state's citizens for the highest of duties – voting.